"He's home," former Vol Fred White said. "This is where he's always wanted to be. Regardless of what other people thought, we knew where he wanted to be because of the conversations we've had with him. The love he has always had and always will. One of our own being back on campus is just like when Coach Pruitt hired Terry Fair back. We know they know what the fabric of being a Tennessee Volunteer means." Former Vol offensive lineman Brad Lampley played alongside Martin during his career in Knoxville. All these years later, Lampley's son Jackson is set to enroll this summer having signed with the Vols in December. 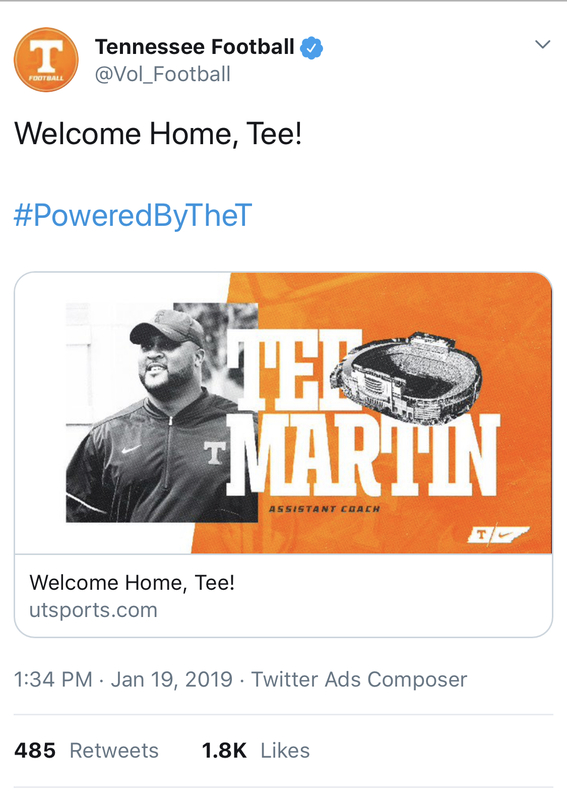 From playing with Tee to having his son play for a team coached by Tee Martin, Lampley sees a step in the right direction. "It's the latest example of Tennessee truly getting back to being Tennessee again," Lampley said. "Coach Pruitt is from Alabama, but he grew up in a time when Tennessee was great on the football field and so he remembers and knows what Tennessee football is. With coach Fulmer being the AD, and what Jeremy has put together Terry (Fair), and other guys in the program in various roles, I think to bring Tee back is significant on levels beyond just football." "I just think it shows how the program is turning," former Vol running back Jamal Lewis said. "Bringing back a national championship quarterback who played at Tennessee shows the dedication of the organization. It will help in recruiting and give a sense of security as a former player. He is someone that has done the same thing we've done and put on the pads alongside of us." I've heard some of that. I've also heard persistent rumors about Pittman (the fact that Friend is more than willing to change positions is fueling that fire). Regardless, I think there are more upgrades to come - don't know who but I do believe there's more. What the hell is wrong with oleyeller...? Lol, oleyeller is such a dumb piece of shite. The goal has switched to "rustle oleyeller's jimmies" in this thread. Where is that octogenarian? I think I’m gonna buy oleyeller stock in bulk. Could it be that he has rolled up VOLS? I didn't take him for a Jimmy rustler. Maybe that's what made him so successful. Hail, Troll-king oleyeller! He's playing the long game if your assumptions prove accurate. This is the only board I have ever been on, so I may not have a well-rounded appreciation for the quality here, but most VOLS on tRANT seem to hold themselves together. Makes me miss SavageOrangeJug and his nuclear meltdowns. What happened to that guy? A prominent poster on Fl98 took Jug up on an offer of meeting irl and engaging in fisticuffs iirc.